Merri Travels on Endurance.net: 2011 Scottsdale Arabian Show - "Look at those Hairy Horses!" 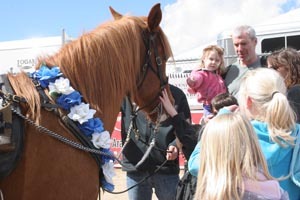 2011 Scottsdale Arabian Show - "Look at those Hairy Horses!" 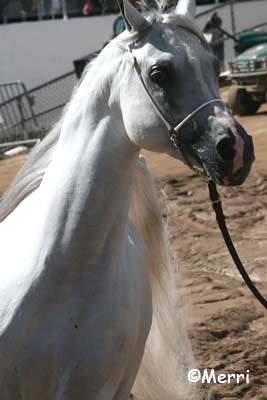 Mouths agape, the teenaged girls-used-to-show-horses stared at Rusty and the hairy Redford as they trotted around the arena in the Scottsdale Arabian Show Parade of Champions. "Look at those hairy horses!" 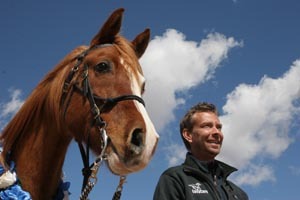 It's the first time (we believe) that endurance horses have ever appeared in the Scottsdale Arabian Show Parade of Champions. 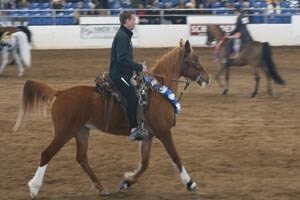 (Aileen Baca also rode in the Parade of Champions, on her horse R Star Ghostdancer). It was definitely the first time that horses have appeared at the Scottsdale Arabian Show that have not had every excess hair clipped from their bodies. 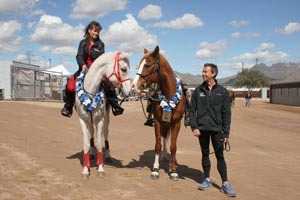 Rusty and Redford had won the 50 miler, and Aileen and R Star Ghostdancer had won the 25 miler at the AAHA Halloween endurance ride in October in Scottsdale, and were included in this Parade of Champions. Various Championship winners from the 2011 SAS rode in the Parade (English pleasure, Western pleasure, working cow horse, mounted native costume, and others), all perfectly manicured and polished and clipped. The two hairy endurance horses - especially Redford - looked like shaggy bears compared to the other slick and sleek horses - but they showed off just as well and they looked just as good (better, in my biased eye). And they were most approachable: Redford was constantly surrounded by kids who came up to touch him, pet him, and hug him, because he was so quiet and well-mannered. Redford did get scared a few times before the Parade, by not only the WooWooing people and the popping whips and the shaking trash bag and the hands banging on banners and fences, but by the startled wide-eyed horses that were rearing and spooking and snorting and being chased into the arena. Rusty had to walk Redford far away from the Madding Crowd every time that happened. This year's Parade of Champions was an historic event where, as Kevin put it, "The Two Worlds Meet," and indeed they did. Redford had never been so primped on (and still managed to look wooly and rugged), and some show people surely had never seen such an endurance Arabian before. BTW Rusty, where is your helmet?? Riding with a helmet would have really caused a bigger stir! !